Chalet Classic 1800 avec une touche de bon goût de moderne! Idéalement situé sur la rue principale, au cœur de la ville en face du quai du port. Auto chalet contenues composé de salon, cuisine, chambre principale, chambre double et salle de bain. Habillé comme un mélange de pays et la fourniture de rétro années 60.
location de vélos de ville soit la route, piste ou village disponibles, et la location de kayaks juste en bas de la rue comme ce est piscine municipale et des courts de tennis. Service de conciergerie disponible moyennant un supplément, le vin par le cas, gelé personnalisé dîners pour le congélateur, des excursions de voile, Whale Tours. Chef de cuisine traiteur dîners ou Guide de Voyage locale sur demande pour des frais. The Cottage on Main was the perfect blend of location, style and functionality. A funky yellow character cottage on the waterfront, decorated with mid-century and 19th century flair. Great kitchen, big bathroom, turquoise painted bedroom floor, Italian reading lamps - it's all there!! And situated in beautiful Mahone Bay. What more could you want! We loved it and would highly recommend. 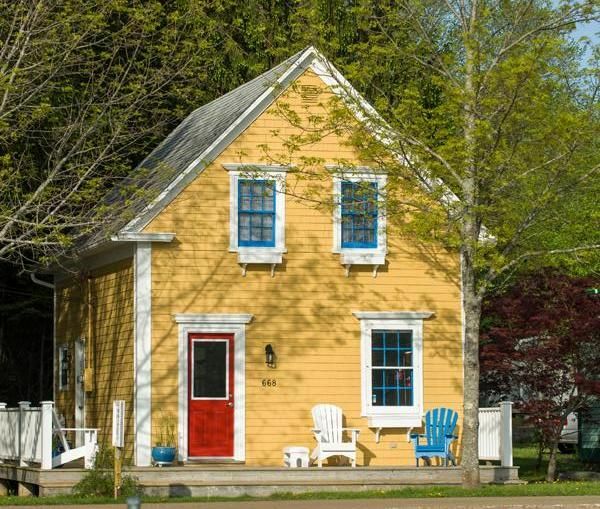 Mahone Bay is known for their colorful houses and this is right in line and is so well thought out and equipped that I can't imagine any place better to stay. The location - right across the marina offers lots to see (great view of the three churches) and with in a short walking distance from everything you need - coffee, grocery, restaurants, shops, ice cream. The house is amazing - high end appliances and finishes. Owner was very responsive and we enjoyed our stay in this magical area. We rented the cottage for two weeks during an extended sailing trip in September, 2017. Since it is right across the street from the Civic Marina it was very convenient for us. Everything you need for supplies - groceries, coffee, restaurants, fuel, booze - are within walking distance. The home is very clean and well supplied for guests. Chris Reardon was an outstanding host. I highly recommend this rental. The house was extremely comfortable and had everything that was required to ensure that we experienced an excellent vacation. We wouldn't hesitate to recommend this rental and the town of Mahone Bay! Visit and you will fall in love with the town and its residents. Overall we liked the house. It was well appointed in a good location. We also liked having a washer/dryer. The street was noisy, however, particularly being across from the public marina where construction was occurring. The landlord did not provide very complete information about where to find towels, supplies, etc. It would have been much easier if he had provided a binder with maps, etc. contain plenty of extra everything for any need ! An unique and quaint property that is all and more then advertised. 50% deposit on booking, remainder 65 days before reservation date. 100% refund 65 days before booking, 50% refund 30 days before reservation date. $100. pet fee per week, $100. 3rd adult fee.